Explanation: Why are there unusual pits on Pluto? 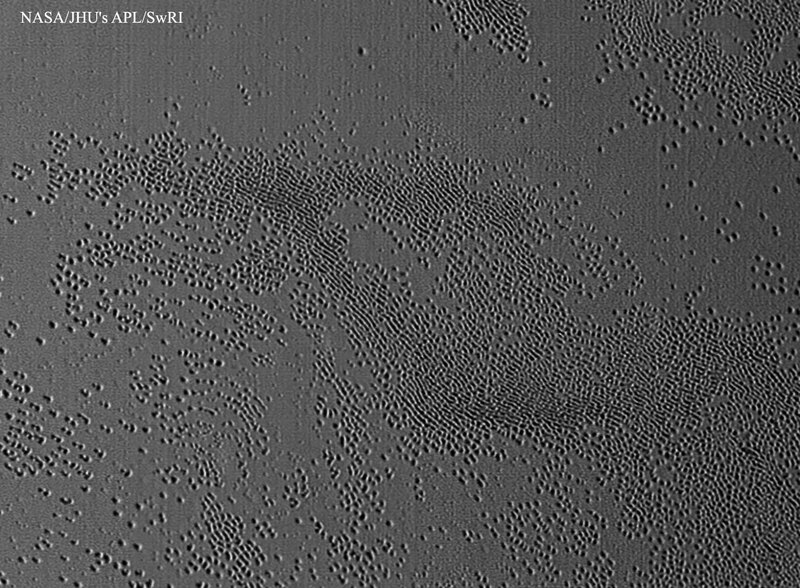 The indentations were discovered during the New Horizons spacecraft's flyby of the dwarf planet in July. The largest pits span a kilometre across and dip tens of metres into a lake of frozen nitrogen, a lake that sprawls across Sputnik Planum, part of the famous light-coloured heart-shaped region named Tombaugh Regio. Although most pits in the Solar System are created by impact craters, these depressions look different -- many are similarly sized, densely packed, and aligned. Rather, it is thought that something has caused these specific areas of ice to sublimate and evaporate away. In fact, the lack of overlying impact craters indicates these pits formed relatively recently. Even though the robotic New Horizons is now off to a new destination, it continues to beam back to Earth new images and data from its dramatic encounter with Pluto.